The Leader was not the first Avengers Assemble toy I bought - that honor actually goes to Red Skull. We've come a long way from the days when Red Skull could only be a rare chase variant (or worse, an SDCC exclusive). But that's what happens when you appear as the main villain in a major motion picture. The marketing can't ignore the main villain, even if he is a Nazi. And then the precedent is set, and when the second movie rolls around he can just be a normal mass market Marvel Legend. There's no biographical text on the back of the card - just generic chatter about the line's SHIELD Gear ("works with most other figures!" like that's something special and not a bare minimum level of effort for action figure accessories, guys, come on! ), but you know who Red Skull is. If you don't, we just linked you to a bunch of reviews that can tell you. Here's one more. 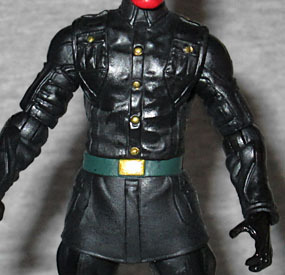 For the most part, this figure is the same mold as movie Red Skull, which is good: that was a really snazzy military uniform he was wearing, and now it looks even better by virtue of being done in black instead of grey-green. It's a classic look, with tall leather boots, fancy jodhpurs and a jacket with a high, folded collar. The only spots of color are his green belt, gold buckle, and the golden buttons on his shirt. His clothes are matte black, while the gloves and boots are gloss, so they'll look like leather. Thankfully, the head is new. You'll remember that the movie toy was based on Hugo Weaving's on-set makeup, rather than the final CGI effect, so it had the black "puppy dog" nose. This one, based on absolutely nothing, does not. It's a big, bony face, with an awful lot of jaw - he's very square. It still has a hint of ears and lips since, remember, it's not actually a skull. He's got a balljointed neck, swivel/hinge shoulders, elbows and hips, swivel wrists, waist and thighs, double-hinged knees and no ankles whatsoever. His left hand is still open to hold the Cosmic Cube that he no longer includes. He does, however, include a new hat with the Hydra logo on the front, and the coat from Indiana Jones' Toht. Brilliant! His only weapon is a "Cosmic Cannon," which is really just the flamethrower from the "Dark Threat" Hydra Soldier that was in the first movie line. It even has the same projectile. It will fit very nicely into the back of a drawer you never care to look in again. The coat and hat are the important things. Red Skull has not easy to find, and his accessory is junk, but the reused sculpt and the new clothes add up to make a worthy action figure.